“I don’t feel older than 35!” My children laughed as I explained my difficulty imagining myself as middle aged (or a bit older). I shared how in my mind, I’m still young. While they composed themselves, it gave me more perspective on older adults who struggle with decreasing mental or physical capacity. I’m sure when I’m 80 or 90, I’ll feel much younger and have similar expectations. 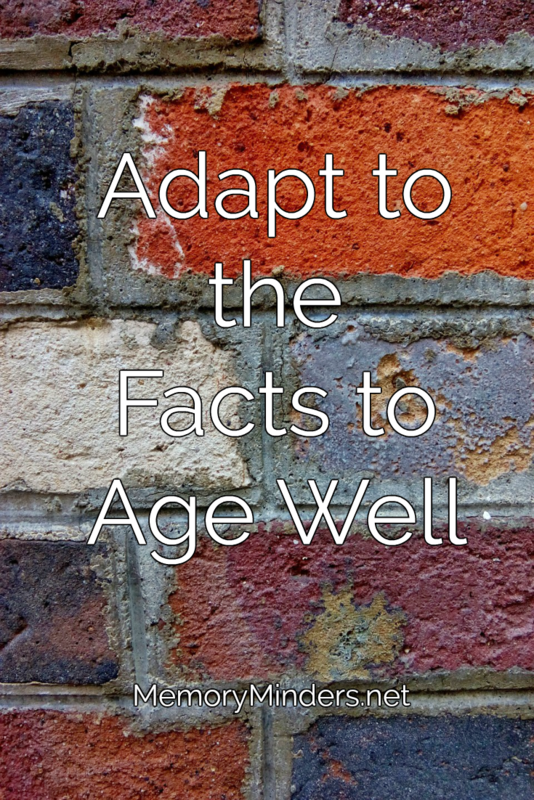 Here are some aging facts and how to adapt for a more memorable life. FACT: It takes longer to process information as we age. ADAPT: Give ourselves and others patience and grace. An extra few moments in the big scheme of things isn’t a big deal, except in safety situations like driving. Let’s build extra time into our schedules to alleviate stress. Don’t try to go so fast. We may miss important details by rushing ourselves or others. In safety situations like driving, be realistic and adapt choices accordingly. FACT: Multitasking is more difficult as we age. ADAPT: Don’t multitask! Try to pay attention to as few things or ideally only one at a time if possible. Train yourself to do one thing well and then move on. I personally struggle here too, as multitasking is a difficult habit to break. But I also know how well I perform when focused intently. This takes practice, discipline and forced concentration for many of us, but it’s well worth it. Better memory, improved quality, and efficiency are by-products of unitasking. FACT: Use your brain cells or lose your brain cells. ADAPT: Just like a muscle, if brain cells aren’t used, they will atrophy and eventually won’t work at all. When younger, we used various parts of our brain with work, raising families etc. As we age, we must make more of a concerted effort to utilize all parts of our brain frequently to maintain peak performance. Insert mental fitness fun into every day and experience a stronger mind and memory! FACT: Physical fitness helps both body and mind. ADAPT: Years of research is proving time and again the lasting impact of physical exercise for a healthy mind and memory. Insert this into your daily routine in a purposeful way with regular exercise and also lifestyle behaviors: walk rather than drive if possible, park further away, take the stairs. More movement will benefit both body and mind. FACT: Short-term memory loss is more typical than long-term memory issues. ADAPT: Most people who are having issues with memory have an issue with short term memory loss. This is due to many of the above facts-decreased processing speed and lessened focus for starters. Short term memory often involves new information. So, use memory techniques to help yourself: write it down, use associations etc. Don’t be embarrassed or ashamed to assist your memory. Those who utilize memory techniques are much more successful in maintaining their short term memory as they age. We are all getting older. Understanding the facts and how to adapt our habits and lifestyles as we age are crucial. If we can we remember these, we can continue to act as young as we feel!